The owners of Hendre Farm, Pembrokeshire installed an HDG Euro 50 as a new source of heating. Badaguish Outdoor Centre, a skills and activities centre in The Cairngorms National Park, has specified a BioWIN wood pellet cascade boiler system from Windhager UK to provide heating and hot water for new buildings on the site, located in the Scottish Highlands. 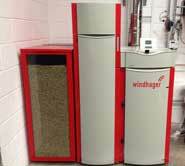 Windhager UK has supplied a biomass wood pellet boiler to an award-winning building in St. Werburgs, Bristol.